Tablets are not selling as well as before - Q4 of 2017 saw 7.9% less tablets shipped compared to Q4 of 2016 while 2017 as a whole saw a decline of 6.5% over 2016. 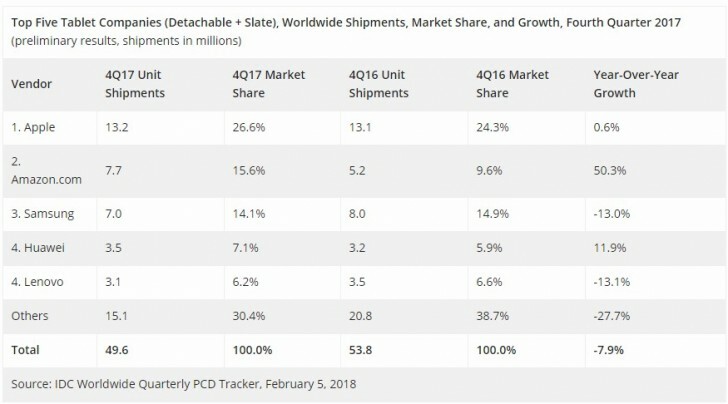 And yet despite this turmoil Apple, Amazon and Huawei managed to see growth in slate shipments - both in the final quarter and in 2017 in general. 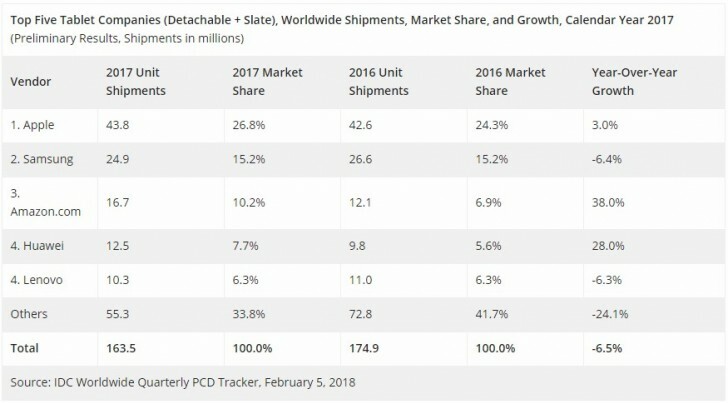 Apple shipped the most tablets in Q4 of 2017 and 0.6% more than the previous year while Amazon achieved a huge 50.3% jump over last year's Holiday quarter thanks to some aggressive discounts. Samsung dropped to third in Q4 of 2017 and saw a 13% decline of tablet shipments compared to the final months of 2016. However, Samsung retained its second place in total tablet shipments for 2017, despite losing some market share. Despite lackluster efforts from Huawei it still achieved a quarterly growth of 11.9% and yearly improvement of 28%. Samsung dropped to third because people realised its rubbish. Amazon tablets are so much better.